Fruity taste. 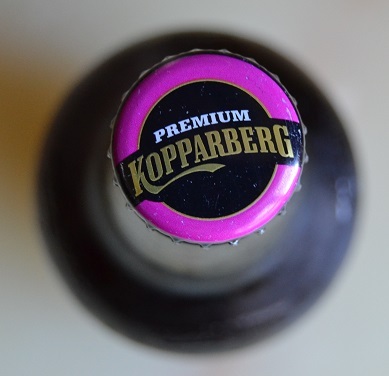 Comes in a brown glass bottle with Kopparberg embossed on it in the surface of the glass. Reminds me of that ‘soft drink for adults’ Shloer. Mellow yet with a sharply accented aftertaste. Definitely a play of berry flavours upon the palate. What does that mean? Its got that same sort of carbonated soda water taste as Appletiser drinks and tastes like you expect ie raspberries and blackcurrant (but sounds more learned than just saying it as it is because I don’t know what to say really for some of this ‘just to keep the blog updating regularly’ throw away food and drink posts). 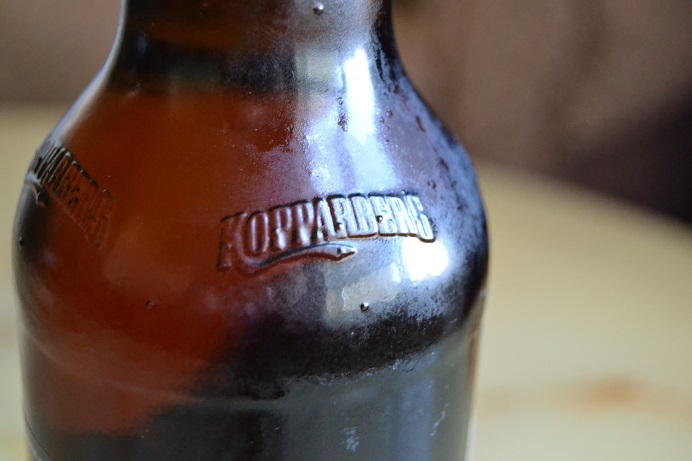 Quite fizzy… if anything a bit more than it should do as though the carbonation process is similar to mineral water rather than the big brand soft drinks. It has a deep pink colour when poured out. There is enough for about two and a half highball glasses in each bottle. I would order this if I saw it on a menu although it is more of a summer drink. … and now the stuff it says on the bottle. 714 82 Kopparberg Town, Sweden. Contains sulphites to preserve freshness. I will review…. something more interesting on the weekend. Be aware: Drinking beetroot juice may turn your urine pink – this is quite normal! So as usual, interspersed with a few comments, let me quote all the information of the side of the carton so you can read it at your leisure rather than being one of thosse awkward looking people who stands in the isle reading the side of packaging like a neurotically obcessive calorie counter. … that’s expensive. If companie’s put words like ‘organic’ on their produce they think they can charge ridiculous prices. 150ml of BEET IT organic beetroot juice provides one of your daily portions of fruit and vegetables. BEET IT ORGANIC BEETROOT IS BEST KEPT AND SERVED CHILLED. ONCE OPENNED KEEP REFIDGERATED AND USE WITHIN FIVE DAYS. The juice has been pasteurised and contains no preservatives. …I just assume that after the initial release of this drink they were inundated by people calling their customer care lie complaining or worried that their urine had become tinged by it. The red colour compound betanin is not broken down in the body, and in higher concentrations may temporarily cause urine and stool to assume a reddish colour; in the case of urine this is called beeturia. This effect may cause distress and concern due to the visual similarity to hematuria (blood in the urine) or blood in the stool, but is completely harmless and will subside once the food is out of the system. So it is understandable that people unfamiliar with it were worried but to go to the length of telling the producer, which I assume is what happened, is clearly just a ploy to get free produce. A jaded view but there are such people out there and this ‘warning’ is clearly meant to be a clear sign of contempt for those people. Organic farming uses traditional methods like crop rotation and natural pest control rather than pesticides and chemical fertilisers which can end up in the final produce. Artificial preservatives and additives are also a no-no. And we end up with the best tasting juice on the market – why compromise? Ingredients: Pressed organic beetroot juice (90%), pressed organic apple juice (10%). Not from concentrate. We add a small amount of apple juice to smooth the natural earthy taste of freshly pressed beetroot juice. BEET IT retains both the distinctive taste and smell of fresh beetroot. As well as benefiting from great quality ingredients, we want you to really enjoy drinking BEET IT! The natural dietary nitrate varies significantly from batch to batch, but with 90% beetroot juice in beet It, the nitrate content will on average be 0.8g per litre. James White Drinks started more than 25 years ago pressing fantastic single variety apple juices – Bramley, Cox and Russet. We are based at Whites Fruit Farm just north of Ipswich in Suffolk. In 1996, we launched Big Tom, our fabulous spicy tomato juice, which was granted a Royal Warrant by HM The Queen in 2002. Soon after, we started bottling beetroot juice, which we now increasingly supply worldwide. In 2007 we were approached by a group of scientists who were carrying out both medical and sports performance scientific research with beetroot juice. We are very privileged now to be supplying research projects at many universities all over the world. It has been a very exciting experience and their published research findings have attracted much media interest. Please do visit ww.jameswhite.co.uk to learn about our full range of wonderful pressed juices and see some pictures of our new beetroot pressing plant – the first ond only one of its kind in the UK. Help us turn East Anglia purple! Review: It tastes like beetroots obviously so either you will be okay with it depending on if you like beetroots or not. If you do not know what beetroot tastes like then… sweet initial taste an earthy tone once it is on the tongue… to be honest just go try some beetroot for yourself if you don’t already know the taste (in Britain it wouldn’t be surprising to find out someone has never tried it although my grandmother eat them almost constantly). The 10% apple juice is apparently added to ‘smooth the natural earthy taste of freshly pressed beetroot juice’. It is a refreshing juice with an earthy residual aftertaste but once you are used to it the taste is quite pleasant. The price is more alarming than anything, even for a market leading premium product, so maybe try an alternative if you are looking to make beetroot juice a regular part of your diet. In preliminary research, beetroot juice reduced blood pressure in hypertensive individuals and so may have an effect on mechanisms of cardiovascular disease. Dietary nitrate, such as that from consuming beets, may be a source for the biological messenger nitric oxide which induces the endothelium of arteries to signal smooth muscle, triggering vasodilation and increased blood flow. The beetroot is the taproot portion of the beet plant, also known in North America as the table beet, garden beet, red or golden beet, or informally simply as the beet. It is several of the cultivated varieties of beet (Beta vulgaris) grown for their edible taproots and their greens. These varieties have been classified as B. vulgaris subsp. vulgaris Conditiva Group. Other than as a food, its uses include food coloring and as a medicinal plant. Many beet products are made from other Beta vulgaris varieties, particularly sugar beet. Beetroot is an excellent source of folate and a good source of manganese, and contains betaines which may function to reduce the concentration of homocysteine, a homolog of the naturally occurring amino acid cysteine. High circulating levels of homocysteine may be harmful to blood vessels and thus contribute to the development of heart disease, stroke, or peripheral vascular disease. This hypothesis is controversial as it has not yet been established whether homocysteine itself is harmful or is just an indicator of increased risk for heart disease. The usually deep purple roots of beetroot are eaten either grilled, boiled, or roasted as a cooked vegetable, cold as a salad after cooking and adding oil and vinegar, or raw and shredded, either alone or combined with any salad vegetable. A large proportion of the commercial production is processed into boiled and sterilised beets or into pickles. In Eastern Europe, beet soup, such as borscht, is a popular dish. In Indian cuisine, chopped, cooked, spiced beet is a common side dish. Yellow-coloured beetroots are grown on a very small scale for home consumption. The green, leafy portion of the beet is also edible. It is most commonly served boiled or steamed, in which case it has a taste and texture similar to spinach. Those selected should be bulbs that are unmarked, avoiding those with overly limp leaves or wrinkled skins, both of which are signs of dehydration. Beetroot can be peeled, steamed, and then eaten warm with butter as a delicacy; cooked, pickled, and then eaten cold as a condiment; or peeled, shredded raw, and then eaten as a salad. Pickled beets are a traditional food of the American South, and are often served on a hamburger in Australia, New Zealand, and the United Arab Emirates. A traditional Pennsylvania Dutch dish is pickled beet egg. Hard-boiled eggs are refrigerated in the liquid left over from pickling beets and allowed to marinate until the eggs turn a deep pink-red colour. In Poland, beet is combined with horseradish to form popular ćwikła, which is traditionally used with cold cuts and sandwiches, but often also added to a meal consisting of meat and potatoes. When beet juice is used, it is most stable in foods with a low water content, such as frozen novelties and fruit fillings. Betanins, obtained from the roots, are used industrially as red food colourants, e.g. to intensify the colour of tomato paste, sauces, desserts, jams and jellies, ice cream, sweets, and breakfast cereals. Beetroot can also be used to make wine. Food shortages in Europe following World War I caused great hardships, including cases of mangelwurzel disease, as relief workers called it. It was a consequence of eating only beets. Next time… I don’t know what I will post. Nothing involving beetroots that’s for sure. Obviously Jim Jinkins, the creator of the series, had issues with them for some reason and was working through them during the series. It was such a pretentious show and I never liked the colour palette used nor, if I am honest, the character designs although it had its moments. I think there were just too many ‘reflecting on my schooldays’ kind of shows at the time like ‘The Wonder Years’ and ‘Boy Meets World’ (well okay the last one isn’t really but in tone is was very similar). ‘Hey Arnold’ was quite similar but that at least had heart even if sometimes it was a bit heavyhanded in how it addressed certain topics.